Carlos Alfaro was ranked in IFLR 1000 2018 as a highly regarded lawyer in Banking, Energy and infrastructure, M&A, Project development and Project finance. Carlos Alfaro was ranked in Chambers Global 2017 for Corporate M&A as Foreign Expert for USA. Alfaro Abogados was ranked as one of Argentina's recommended firms. Universidad Argentina de la Empresa (www.uade.edu.ar) had distinguished Dr. Gonzalo Anaya for his thesis selected as the best individual proposition paper presented at the XII Argentine Congress on Corporate Law and VII Ibero American Congress on Corporate Law - September 2013. PARTNERS CARLOS E. ALFARO AND SEBASTIAN RODRIGO HAVE BEEN RECOGNIZED AS BEST LAWYERS IN STRUCTURED FINANCE AND IN BANKING AND FINANCE IN THE THIRD EDITION OF BEST LAWYERS. 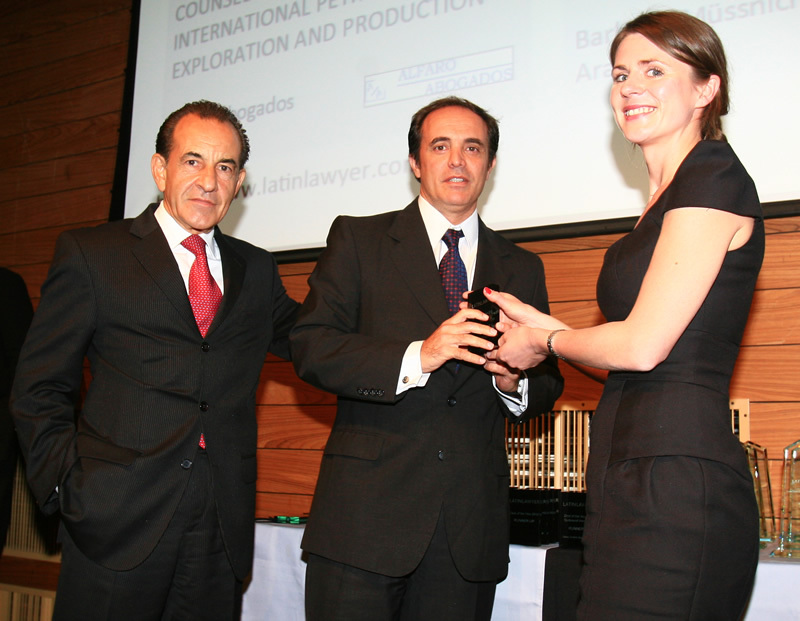 Alfaro – Abogados was recently voted Argentinean Law Firm of the Year by Acquisition International readers. Carlos E Alfaro, Managing Partner and one of the founders of the law firm, tells us the secret to success. 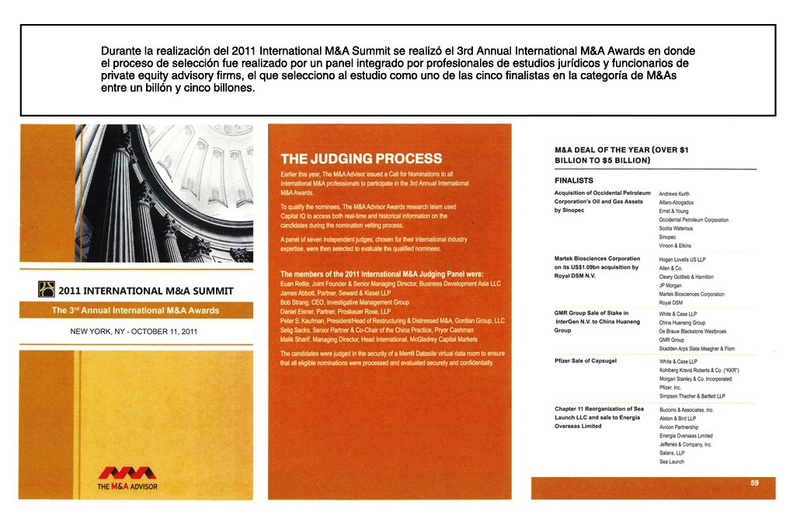 At the 3rd Annual International M&A Summit a jury of prívate equity advisory firms, selected Alfaro Abogados as one of the two finalist in the category of most important local M&As advisors of 2011 in transactions between one billion to five billion dollars. Latin Lawyer recognized Alfaro-Abogados’ partners, Carlos Alfaro and Sebastian Rodrigo, as some of the region's most prominent lawyers at its Annual 2011 charity awards dinner in São Paulo. Banking and Finance and in Mergers and Acquisitions. MARTINDALE HAS RANKED ALARO-ABOGADOS WITHIN THE 10 LAW FIRMS MORE VISITED IN THEIR DIRECTORY DURING 2007-2012 MEASSURED BY NUNMBER OF SEARCHES BY INDEPENDENT PARTIES. Carlos Alfaro of Alfaro-Abogados stands out as “one of Argentina’s finest specialists in international trade and export finance.” His cross-border workload includes advising (banks) on providing pre-finance structured trade facilities to major exporters of soya and oil in Argentina. During the Month of December 2009 Alfaro-Abogados (Argentina) generated the most usage from our users for this category. During the Month of September 2008 Alfaro-Abogados (Argentina) generated the most usage from our users for this category. During the Month of June 2008 Alfaro-Abogados (Argentina) generated the most usage from our users for this category. ALFARO-ABOGADOS RECEIVED RECOGNITION FROM THE WORLD BANK AND THE INTERNATIONAL FINANCE CORPORATION FOR ITS CONTRIBUTION OF THIS SECTION OF ARGENTINA IN THE DOING BUSINESS 2008 PUBLICATION OF SUCH INSTITUTIONS. MARTINDALE HAS RANKED ALFARO-ABOGADOS WITHIN THE 10 LAW FIRMS MORE VISITED IN THEIR DIRECTORY DURING 2007-2013 MEASSURED BY NUMBER OF SEARCHES BY INDEPENDENT PARTIES. MONDAQ.COM: ALFARO-ABOGADOS WAS THE CONTRIBUTOR MOST READ FOR ARGENTINA FOR THE YEAR 2007. During 2007 Alfaro-Abogados has generated the largest number of visits by the users of Mondaq.com in the publishing category. © 2009, Alfaro Abogados SC. All rights reserved. All articles or memorandums listed in this web page may not be reproduced in the aggregate or in part, unless otherwise specifically authorized in written by Alfaro Abogados SC. All trademarks and brand names are acknowledged as belonging to their respective owners. The material presented on these articles and memorandums are provided as a courtesy only. Such material does not purport to be comprehensive or to render legal advice. For advice about particular facts and legal issues, the reader should consult legal counsel.